I have always hosted a Super Bowl party...well, not this year and not last year but just about every year since the Janet Jackson wardrobe malfunction in 2004. Luckily I had the wherewithal as a youth director with 20 or so youth and counselors to NOT watch the half time show but instead to make our own commercials (so I've never even seen the wardrobe malfunction nor do I ever care to see it). Most of the time the Super Bowl parties were youth functions but not always. There were always fun decorations at the Super Bowl parties and I always had the kids fill out the Super Bowl Trivia questionnaire so that I could give prizes. But the reason for hosting a Super Bowl party in the first place is the snacks. I mean that is why we go to a Super Bowl party right? Oh and maybe to watch the commercials. But seriously, why do we only snack like that on Super Bowl Sunday. It's like all the rules are thrown out the window. Forget the diet you can start again on Monday and work out twice as hard to make up for the crappy great way you ate on Sunday. From the wings, to the dips to the amazing desserts there's nothing that can keep me away from a good buffet of junk food. Okay, mostly junk food. Guacamole and black bean hummus have their place, delicious and healthy...but it's the desserts. Oreo truffles shaped like footballs. Football cake pops. 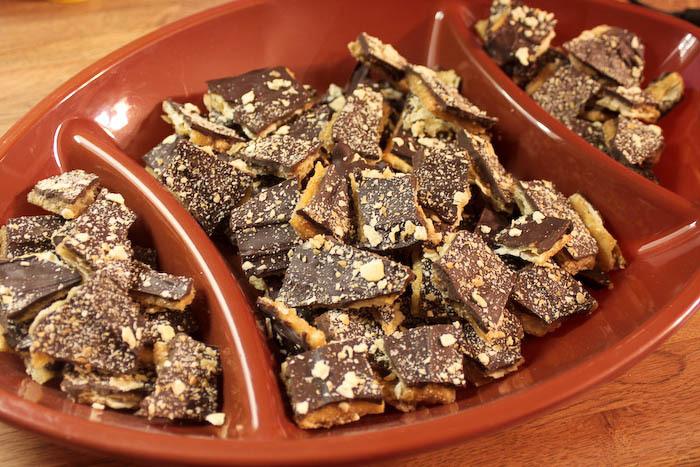 Chocolate Covered Saltine Toffee Crack. Yeah, I made up that name. It's also called Christmas crack. Toffee crack. etc. There's a reason this is called CRACK...it's totally addicting and shouldn't be legal in any state. Please do yourself a favor and ONLY make this when you're going to a party, gathering or will be with other people. Your thighs will thank me later. 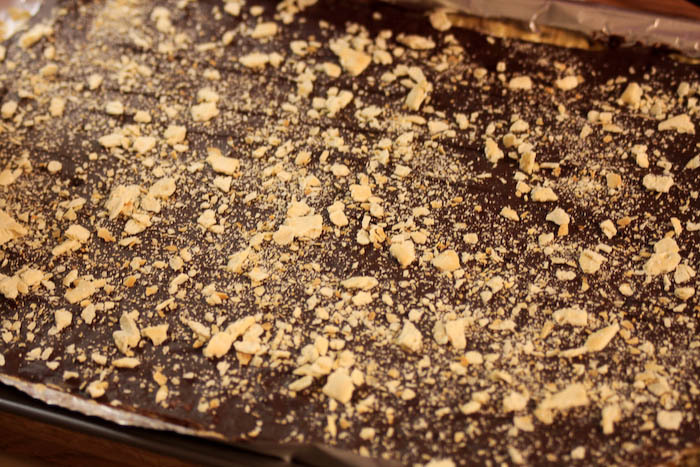 You will want to sit and hoard the plate of crack for yourself. You will want to tell people it's not good in order to keep them away. You will want to hide it, sneak it, leave some at home so you can enjoy it later...but DON'T. This is CRACK and it's better with friends. The recipe for this goodness can be found many places. The one I used comes from Annie Oeth on the Mom Zone blog. You can go there and get the recipe. You make it on a cookie sheet but then you break it up into bite size (small or big) pieces. The good thing about breaking it up into little pieces is that no one knows how much you ate before you brought it to the party. The bad thing about breaking it up into little pieces is YOU don't know how much you ate before you took it to the party. You probably already have everything you need to make this crack on hand. Go ahead, give it a try! You can thank me later!!! We'll be watching the game commercials at my parents house along with our youth fundraiser sub sandwiches, some homemade guacamole black bean hummus, shrimp, a few other goodies and of course some CRACK. Yes, this is legal. But it probably shouldn't be. Tomorrow you'll find me working out a little extra because today I'll be hoarding the crack.